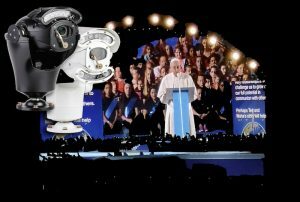 On his 2018 two-day visit to Ireland for the World Meeting of Families, Pope Francis’ scheduled activity was protected by high-performance Predator and Invictus cameras from UK CCTV design and manufacturing company, 360 Vision Technology. Specialists in a wide range of leading-edge CCTV, Access Control,PA, AV and radio communications, County Kildare based Mongey Communications was chosen to provide the additional security surveillance protection measures necessary to secure the Pope’s visit to Dublin. With the massive crowds expected to see the pontiff, the temporary surveillance installation needed to be minimally disruptive and use mobile radio to provide the multi-scene coverage required during the two-day visit. To support an existing small-scale CCTV installation at the Pope’s final venue of Phoenix Park (the largest enclosed city park in Europe), there was a need for further camera coverage along the park’s approach routes, entrance/exit gates, search areas and general areas of crowd movement and congregation. A similar solution was also required for the Pope’s visit to the Knock Shrine pilgrimage site and the Capuchin Day Centre, where public space CCTV was again already in place but of limited overall coverage. Full integration with the existing CCTV system at the 82,300 capacity Croke Park stadium for a papal address to the Festival of Families extravaganza was also required, with communications and CCTV feeds from all locations required to be transmitted back to local on-site control rooms at each location, and additionally to a central Command and Control room at Dublin Castle. At the main Command and Control Centre, the camera images were to be used for co-ordination and management by multiple agencies, including the Office of Public works (OPW), An Garda Síochána, Defence Forces Ireland, Dublin Fire Brigade, HSE / Ambulance Services and Civil Defence. “With300,000 people expected to attend a papal mass at Phoenix Park to close the World Meeting of Families, we were briefed to provide the very best possible reliability and imaging performance from the additional cameras we employed,” explains Kevin McGrath of Mongey Communications. “With this in mind, we needed to be confident of camera reliability straight out of the box, along with simple and fast set-up, and quality high-definition video for forward transmission to the various control rooms. The new 360 Vision Invictus cameras specified for the project employ the latest compact camera modules with a choice of 20:1 or 30:1 zoom and are available with 1/2.8” Sony StarVis or 1/1.9” Sony Exmor (Ultra) sensor packages. Bridging the divide between analogue and IP technology, all Invictus cameras are equipped with Hybrid functionality enabling installation in existing analogue systems and also in full 1080P HD IP video streaming networks. Alongside ONVIF 2.4 Profile S compatibility, this means the Invictus range is not only economical, but simple to install, providing Mongey Communicationsengineers with a reliable, flexible and high- performance solution with which to enhance the existing electronic surveillance measures for the Pope’s 2018 visit. Further enhancing camera reliability for this important event, the new Invictus camera range design draws cost-effectively on features usually associated with very high-end cameras, including construction from high grade, hardened aluminium and stainless steel, to ensure a rugged, durable and compact camera. An upright camera mount design allows full 360-degree continuous pan and unobstructed field of view, plus the ability to tilt above the horizon – enabling operators to view targets above camera installation height (i.e. up hills) – an invaluable asset where cameras were being installed in the difficult installation and operational conditions of Phoenix Park. “Our decision to once again entrust the provision of the best technology available for the project to 360 Vision Technology was proven correct, and we had no issues of consequence with the installation, commissioning and performance of all the cameras – straight out of the box,” explains Kevin. “Because of the condensed set-up period available and challenging terrain of some of the installation areas, we had to act fast to ensure the successful inclusion and full control of the cameras for the multi-agency command and control room,” adds Kevin. “Here our technical relationship with 360 Vision Technology really paid dividends throughout this time-critical project, affording easy integration of all the additional cameras into the control room’s Cathexis VMS. In all, over 60 additional 360 Vision Technology cameras were employed over the various sites throughout the Pope’s visit. With extensive digging and cabling not a practical option, images from the cameras were relayed back to the various event control centres via a network of reliable and secure microwave transmission links, powered by temporary generators and back-up batteries. High-speed fibre-optic connectivity between the various remote sites and Dublin Castle was installed, together with video walls at the various control rooms. “The Pope’s visit was a great success with no security issues reported,” says Kevin. “Images relayed to the control room from the additional 360 Vision Technology cameras were vital in the smooth running of the visit and allowed all of the state agencies involved to keep a constant update on the movements of the vast crowds drawn over the pontiff’s two-day visit.